Elite's EFS-50 ornamental aluminum fence features a unique and stylish design, with the picket heights forming a concave accent at the top of the fence. 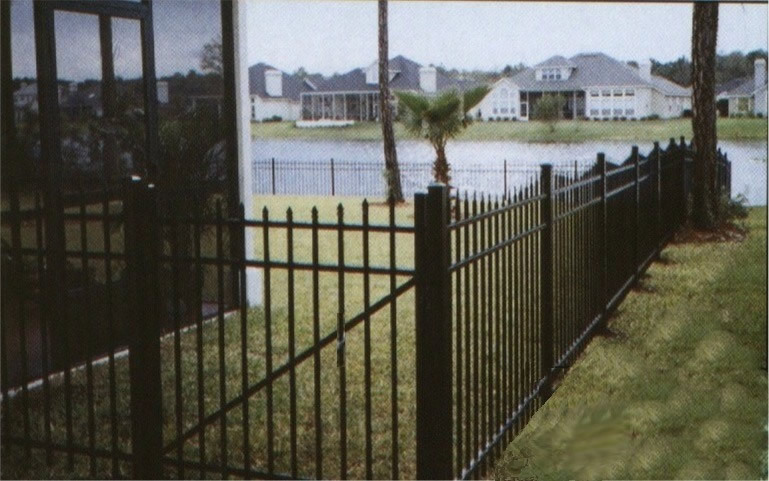 Each Elite aluminum fence is powder coated to help prevent against chipping, peeling, cracking, or other weather damage. On top of being powder coated and being manufactured out of high quality materials, your new Elite aluminum fence will also come with a lifetime limited warranty directly from the manufacturer. Rest easy knowing your fence is protected! Worried about how much time and energy it's going to take assembling your new fence sections? Not with an Elite aluminum fence!! We ship every section of Elite ornamental fencing as completely pre-assembled fence panels. Spend less time assembling your new fence and more time enjoying it. The EFS-50 does not come in a variant that meets BOCA pool codes. If you're looking for a pool fence with a no picket through bottom, we recommend looking at the LifeGard, EFS-10, EFS-15, EFF-20, or EFF-25 ornamental fence styles.